As you explore our site, we'd like to remind you of a few reasons that our many clients continue to trust their security to us. ​* Requires 3 year monitoring agreement with good credit and automatic ACH payments of $48.95/month. ​Many other ​offers and monitoring terms are available so call for details. You can control your security system along with lights, locks, garage doors, and thermostats. You can get text or email alerts with system events or when one of your cameras detects motion and you can watch your live video. Your system can take action or send reminders when it detects you've left the area and some can be controlled by Alexa and many other home automation systems. Regardless of what type of security system you decide on, there are three main principles to security, whether your are a home owner or a business. They are sometimes referred to as the 3 D’s. Deterrence, Denial, and Detection. By filling out the form to the right, you can order a free home security checklist that we will email to you, providing many safety and security ideas. Our main office is located in Overland Park, but we serve a large Kansas City centered region from Harrisonville to St. Joseph and from Grain Valley to Topeka. “Our Priority is Protecting People and Giving You the Peace of Mind You Deserve. Our mission is to make sure that if there is an intrusion, fire, or other emergency, that we notify you and the authorities as quickly as possible." 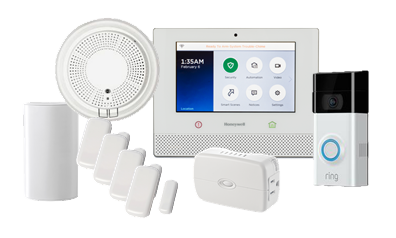 Today there are two main types of security systems: Wireless All-In-One Security Systems and Hardwired/Hybrid Security Systems. ﻿﻿﻿Both systems can support similar of features. Wireless Systems have several advantages, including ease of installation, outstanding value and flexibility in positioning equipment. The hardwired systems don't have as many batteries to replace and have and are well suited for large installations, existing systems, and new builds. Shield installs Honeywell Security Systems in most of our new installations, but we have many customers with 2GIG, Interlogix, DSC, and Ademco.